I was scuba diving in St. Martin and scraped my leg on a rock at the bottom of the ocean. It may have been coral instead of a rock but I didn't really think anything of it so I didn't look at it. When I came up from the dive, my leg was scratched and bleeding a little bit. The cuts on my leg healed and then dry skin formed and now it has turned into this horribly itchy skin rash. It has only been a week but I am confused about how it appeared to be healing very well at first and then all of a sudden it became an itchy skin rash. I was thinking bacterial infection, but I am unsure since it seemed to be healing so well for the first four days. I posted the first post with the picture and just wanted to update even though it's been such a long time, maybe someone will benefit. I never went to the doctor and there was not anything I ever put on it topically that made it better. But, it went away on its own. It took a few months though, maybe three. So, for anyone that has had this even for a couple months and is very frustrated, just give it a little more time. I went snorkeling in St. Croix and just like everyone else here I scratched my leg with coral and it began bleeding but it left an odd shaped rash that hasn’t gone away. I too got scraped swimming in Moorea by a rock in the sea about nine days ago. It is itchy and weeping. I will try cortisone before going to the doctor. I just think it is interesting that we all are experiencing this after a minor scrape in the ocean, mine in Hawaii. If someone could update on what happened to theirs, that would be awesome. I have this right now! It is so gross and I was so worried. But maybe mine will go away too. I literally have it in the EXACT same spot. On the same leg. Exact same here. I went to Greece snorkeling and scraped my arm on a rock. The rash (same as in the picture) went away soon after but it keeps reappearing. I got a rash just like everyone else is describing while I was snorkeling in St Thomas. I bumped my knee into a rock and bled a little bit. The wound is now dry but I have marks on my skin. So glad I found this. I was becoming concerned about the rash on my thigh. I was also snorkeling recently in Navarre, FL and got scraped up on my upper thigh. 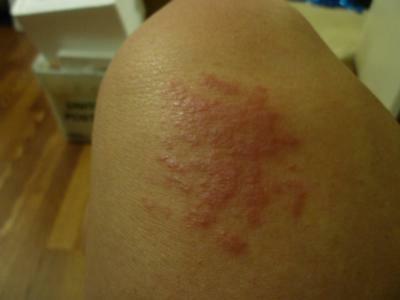 However, it wasn't until about five days later that a very similar rash (as above pictured) appeared! I've been using Neosporin on it and it has actually made it worse. Guess I should just stick with the cortisone. Yes, I have the same thing. I went diving and grazed my leg on some coral a week ago. It bled a bit but the scratches healed within 4 to 5 days. Now I have this crazy itchy, bumpy rash. I will see what happens in a week's time. I am the person that originally posted this. The rash went away and I never ended up having to go to a doctor. Just use hydrocortisone if it itches and be patient. It took awhile to go away though, a couple months maybe to go away completely. Who knows what it was. I scratched my leg on coral in Maldives over Christmas. It has healed but now I have an itchy rash too! Did yours go away? Same Itchy Skin Rash after Abrasion Happened to Me! I just got the same thing in St Martin! What did you do that helped? Did it go away? I let it go for a little over a week and then it started to heal on it's own. I put hydrocortisone cream on it only when it was very itchy. Other than that I didn't do anything at all. I can still see it but it's almost gone. I'd leave it for a week or so and if it doesn't improve or gets worse I'd go to the doctor. Hi, I recently went snorkeling and cut my arm on rock/coral and now have a similar condition. Did your bumps go away by themselves or should I go to the doctor to get it looked at.